Recently the Society of Industrial & Office Realtors® (SIOR) celebrated its 75th anniversary, and in true SIOR fashion, we have already begun charting what the next years will mean for the organization and the industry. As leaders of this great organization we are fortunate to meet and spend time with some of our industry’s best and brightest minds in commercial real estate, from brokers, to developers, to other skilled professionals. Advanced education, in depth conversations about the market, high-level networking, and balanced presentations lead everything the organization does. It is only fitting that over the last year SIOR also publicly set its sights on the future, making the pivot toward its next 75 years and how it will lead and shape the commercial real estate landscape. SIOR Board members with General Session Speaker, Erik Qualman, at the Fall World Conference in New York City. 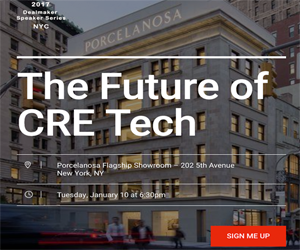 The future of commercial real estate is fully susceptible to substantial shifts based on the convergence of so many different technology disruptors that are on the cusp or coming quickly. From robotics, artificial intelligence (AI), automation (the Internet of Things or IoT), and autonomous commercial vehicles, drones and VTOL aircraft, to big data, additive manufacturing (3D printing), and microgrids, these new realities and more are on our doorsteps now. In fact, these disruptors are not just transforming commercial real estate, they are transforming every industry and every company; no one is immune. Consequently, SIORs as thought leaders must get ahead of such disruptive forces and even help to shape them, therefore we are spending an increasing amount of time and resources doing just that – learning, exploring, and evaluating opportunities now that will position SIORs to lead the commercial real estate industry and their respective clients into the tech-driven future. Technology’s role in the future of commercial real estate is destined to reinvent both the built environment and the businesses that live there. Soon, all businesses will be tech businesses that happen to focus in real estate or e-commerce or some other specialty. SIORs understand this paradigm shift and are already hard at work to lead the conversation, harness the opportunities, and deliver the results. SIOR represents today’s most knowledgeable, experienced, and successful commercial real estate specialists. Our membership has, and always will, remain focused on quality over quantity. Furthermore, integrity leads the mindset of SIOR and its members. While SIOR places tough requirements for its candidates to qualify, once achieved, the SIOR designation provides immediate benefits including the prestige associated with membership, not just in the U.S. but around the globe. SIOR was ahead of the curve during the organization’s formation in the early 40’s, later when the first woman joined in 1950, and as it sought to invest in and develop industrial space for solar energy back in the early 80’s, to name only a few examples. Today, SIOR is still on the cutting edge of modern day industrial and office trends. By focusing on technological innovation while also pioneering unique avenues for person-to-person networking across the globe, SIOR is positioned to continue to lead the way for industrial and office professionals into the 21st century and beyond. Members mingle with during an SIOR World Conference. We have witnessed firsthand the extraordinary level of deal making that takes place within SIOR. This occurs locally, regionally, and on a global level. Don’t take our word for it – look at the countless member to member deals featured at sior.com. The numbers are impressive and speak to why SIOR continues to thrive. Members make connections at professional events such as this Speed Networking session. SIOR assists members to expand and build upon their network through local chapter events and both regional and global conferences. There are two global conferences held every year where a thousand plus members and industry players come to one place to network, learn, and generate leads. Qualifying for the designation is just the first step in achieving real value from the organization. SIOR courses provide professional development to enhance members’ knowledge base and skill set. Through the SIOR Report magazine and other distinct platforms, members are informed of issues, innovations, and reports about the industry. Tips and expert advice are continually provided to help members succeed, including high-level marketing tools. We would recommend it to anyone who values the importance of high standards and a transformative, continually improving approach to their career.